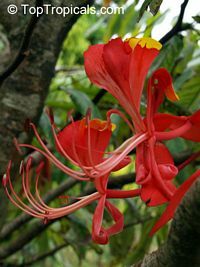 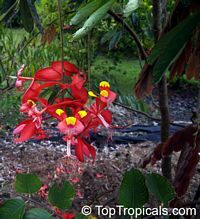 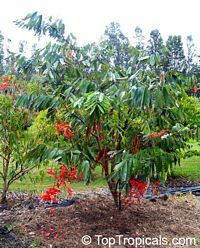 Perhaps the most beautiful of flowering tropical trees, certainly attractive enough to earn the sobriquet Queen of Flowering Trees. 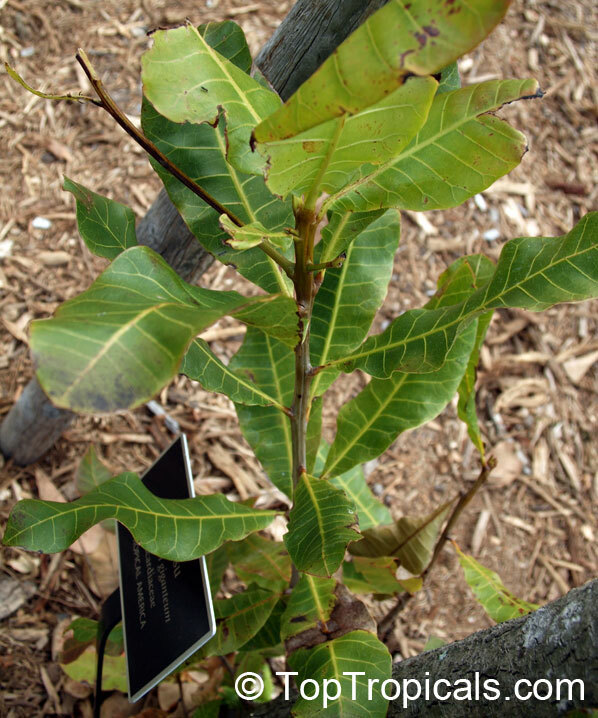 Obscure origins add to the mystique of this noble petite tree. It has only been collected from the wild a couple of times, in the forests of Burma, leading to its common name Pride of Burma. 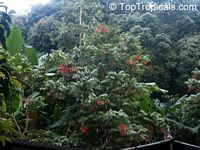 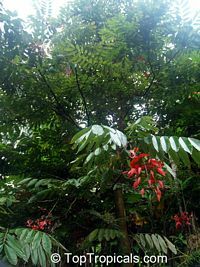 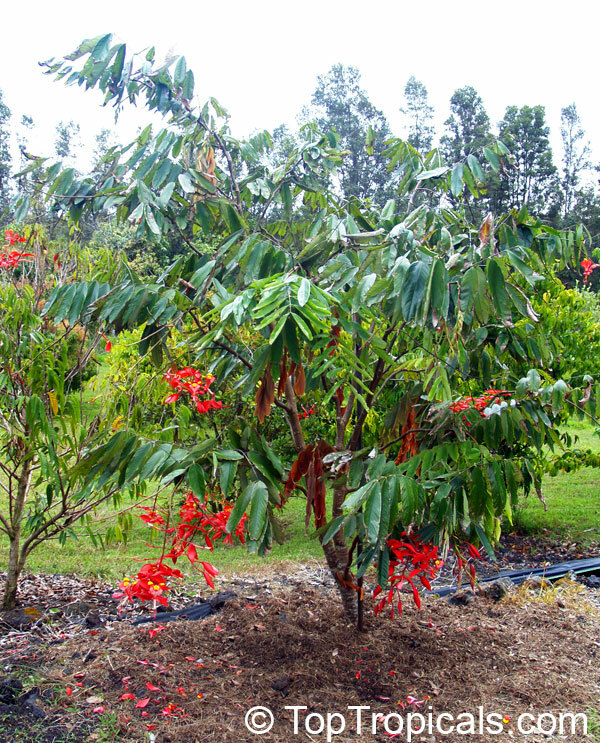 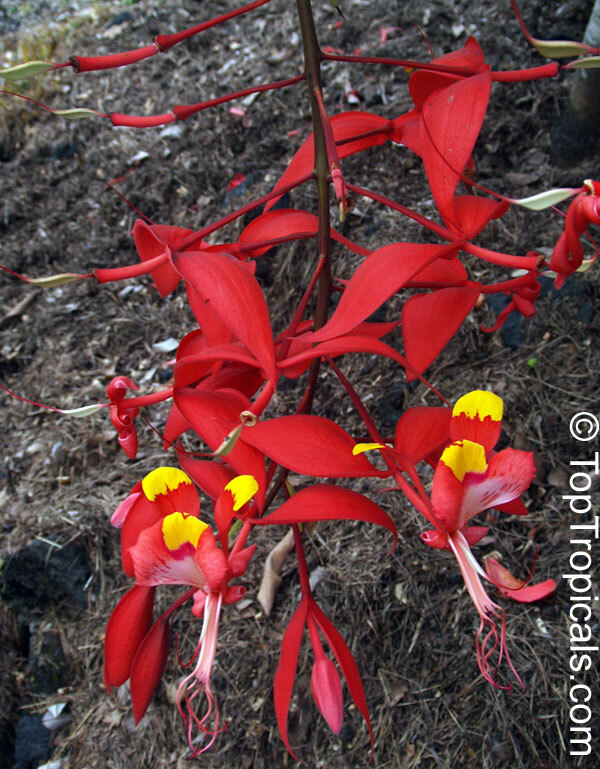 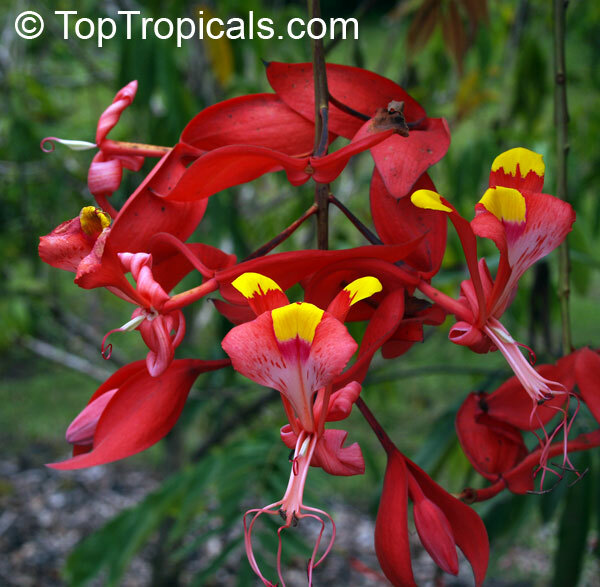 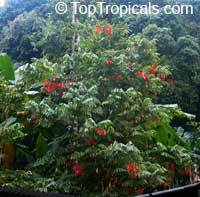 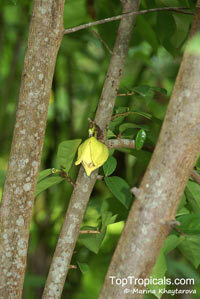 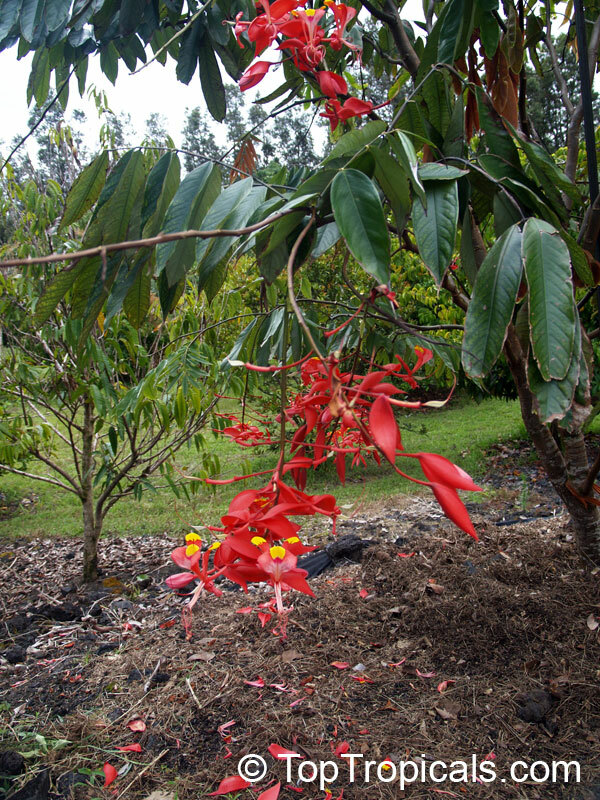 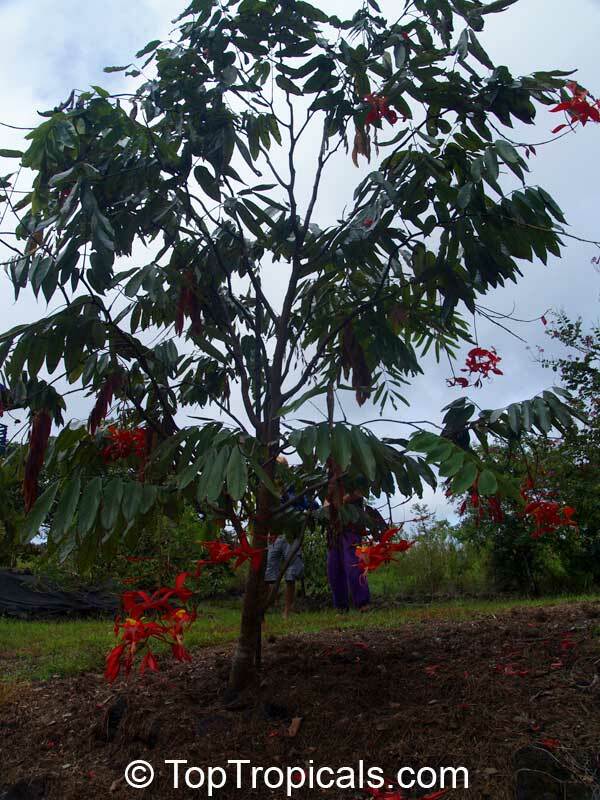 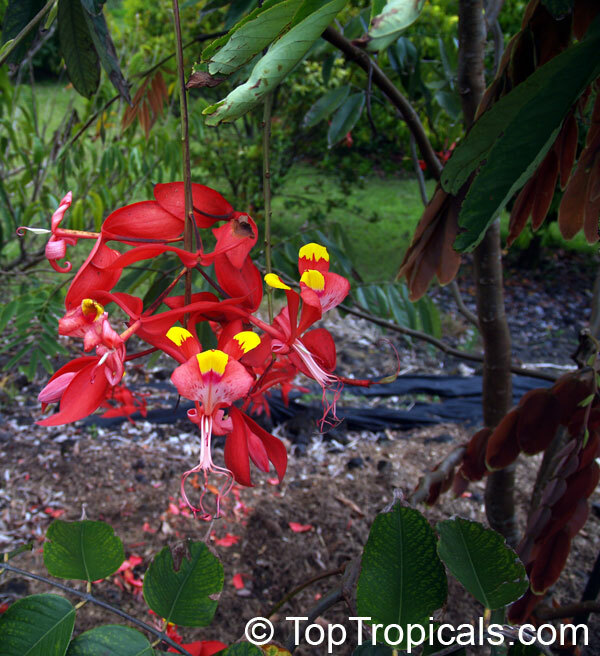 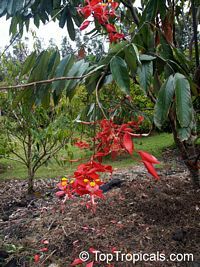 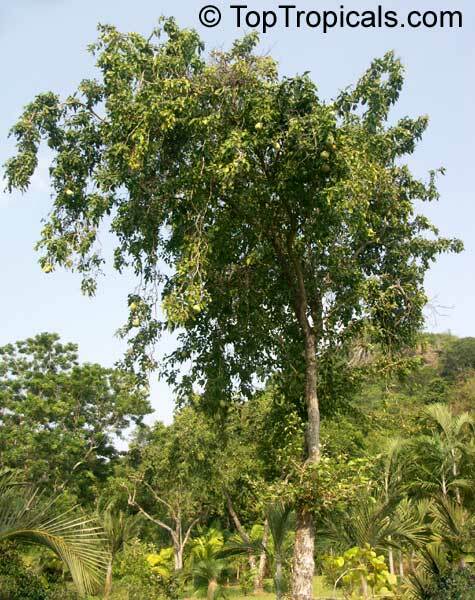 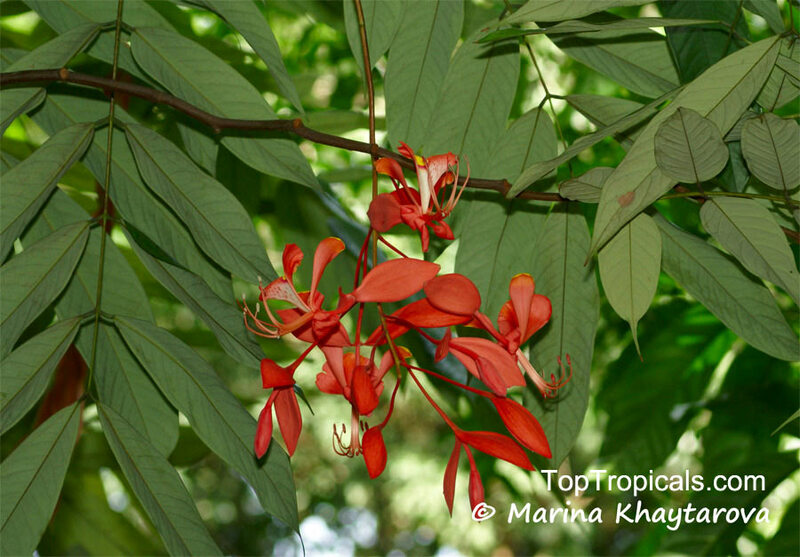 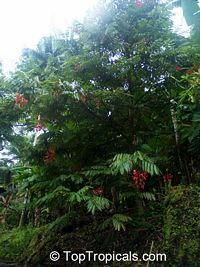 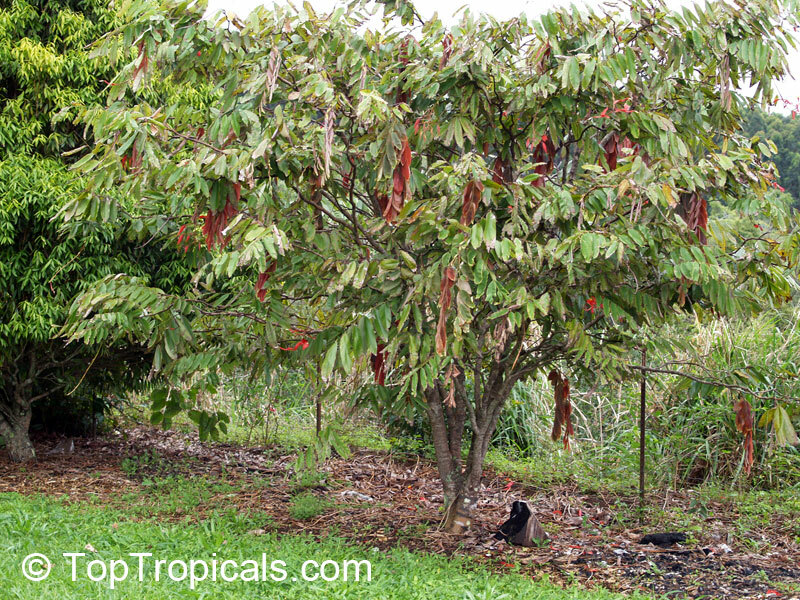 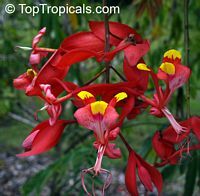 The tree has compound leaves and a great profusion of large, irregular, yellow-spotted scarlet flowers. 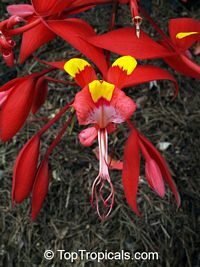 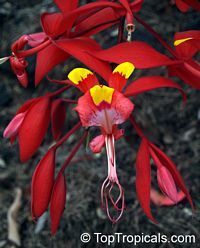 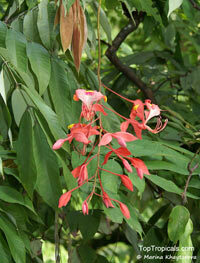 The genus is named after Lady Sarah Amherst, who collected plants in Asia in the early Nineteenth century. 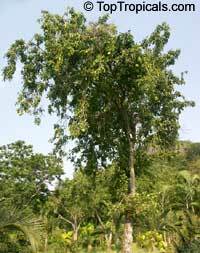 Not only is she commemorated in one of the most beautiful of the worlds trees, she also lends her name to Lady Amherst pheasant one of the most elegant birds. 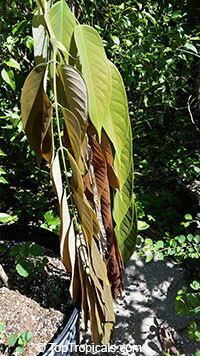 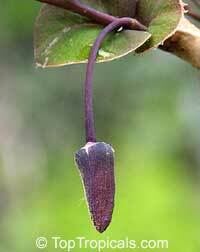 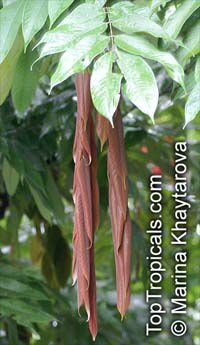 The new leaves are produced in flaccid pale tassels that turn purplish before they green and open out. 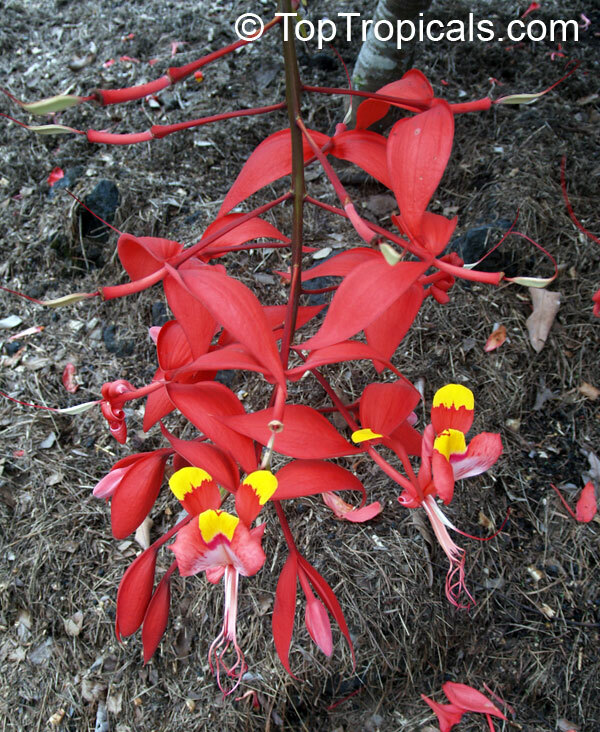 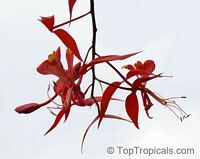 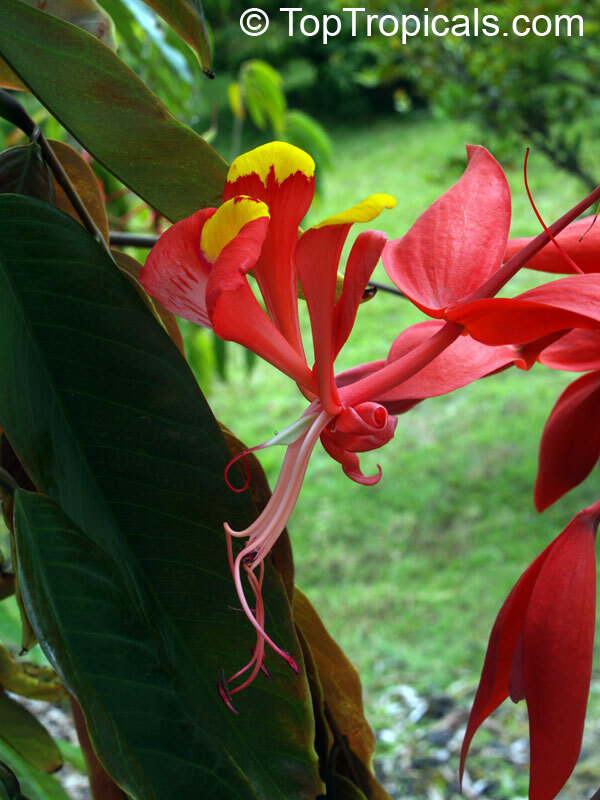 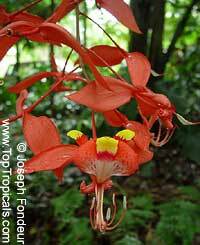 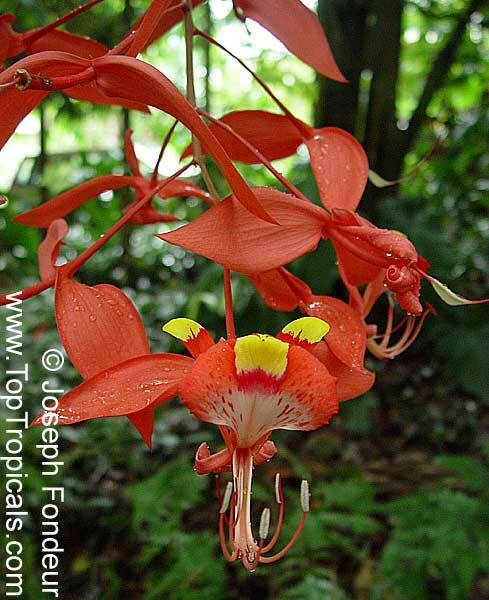 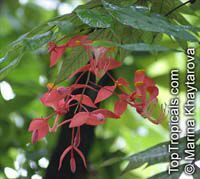 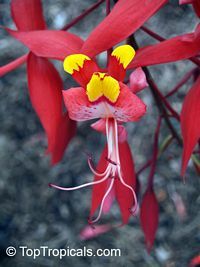 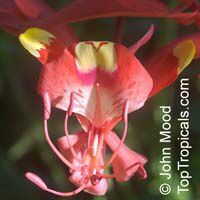 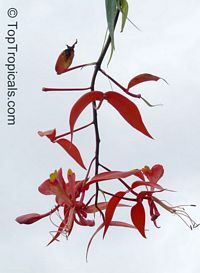 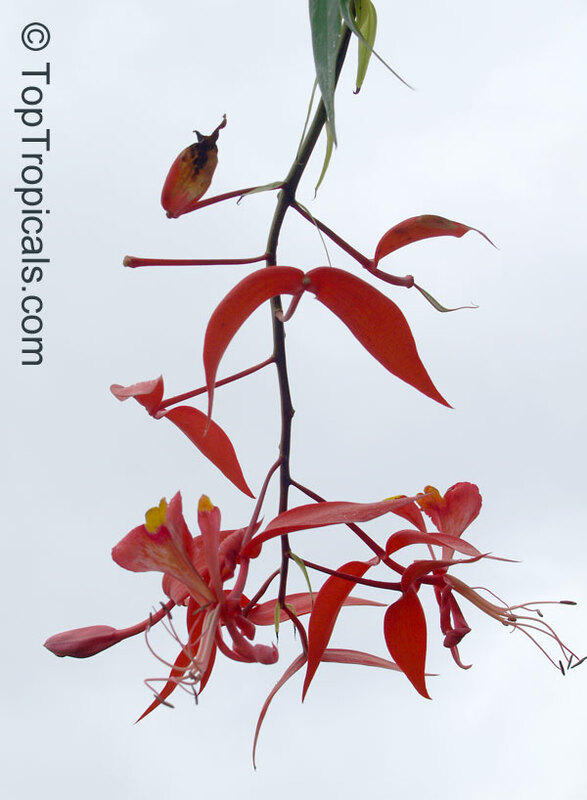 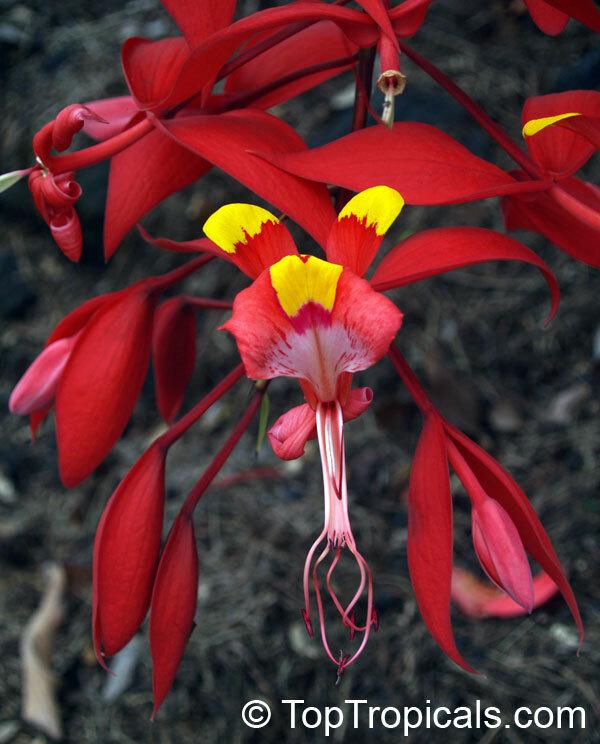 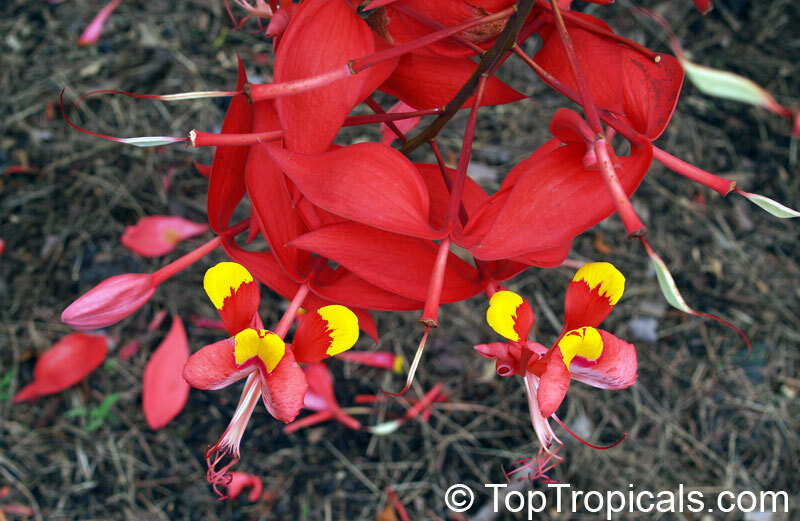 When not in flower, Amherstia looks similar to Saracca, another Asian legume genus. The leaves unfurl in handkerchief fashion like the Brownea and Maniltoa. 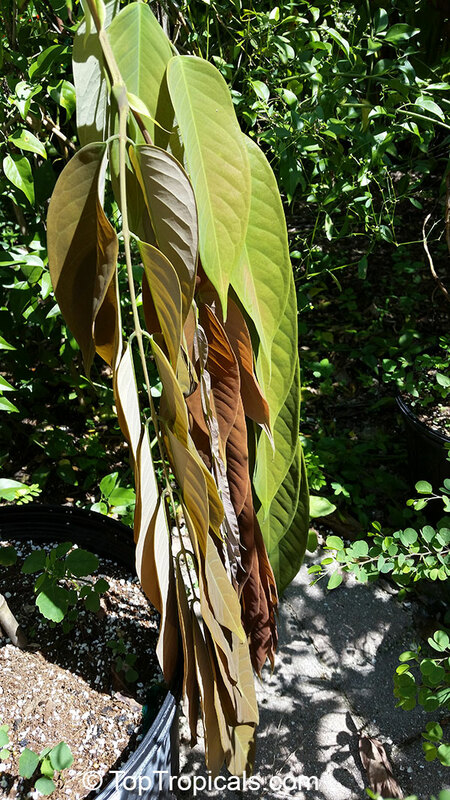 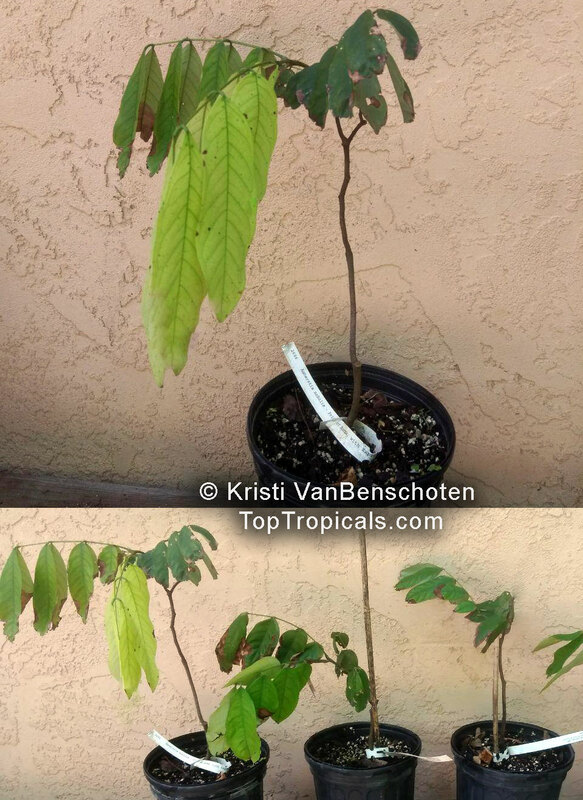 New leaf growth is reddish, hangs down at first. 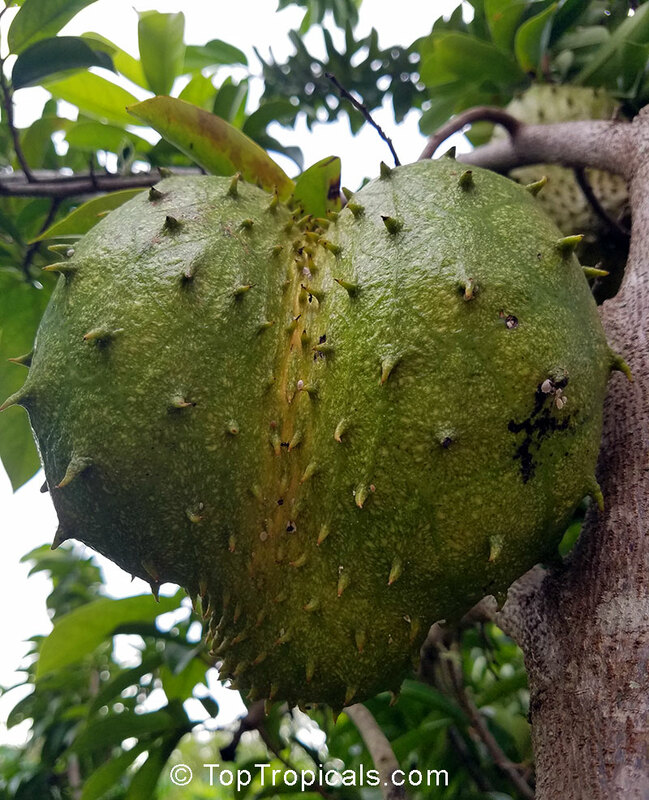 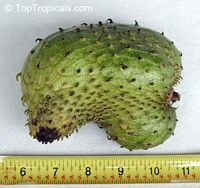 Similar to the Anacardium occidentale, the Anacardium giganteum is a juicy, false fruit with a slight strawberry flavor. 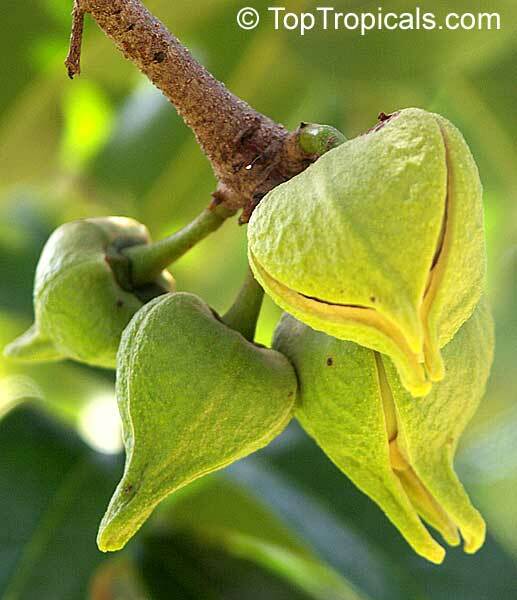 Nuts can be roasted and reportedly taste like cashew nuts. 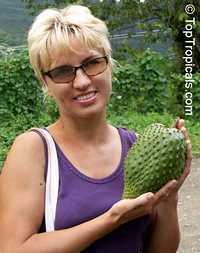 It is a rare Anonna. 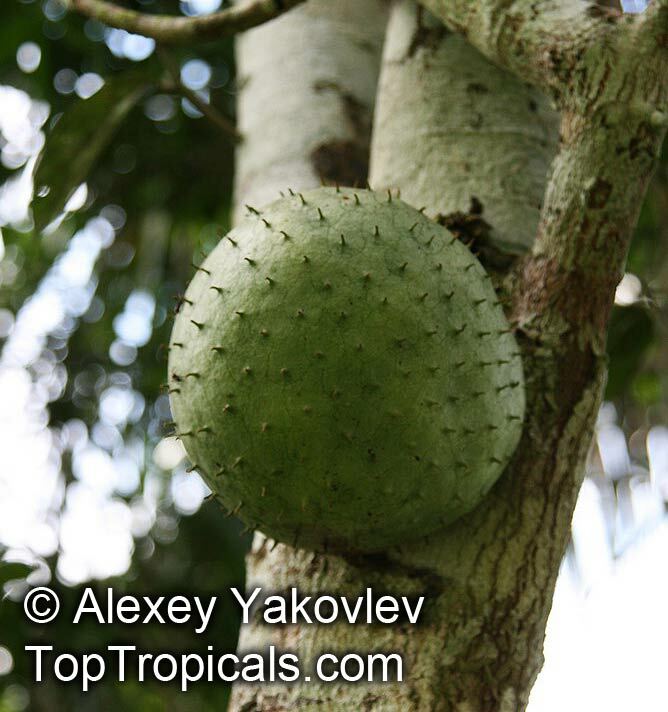 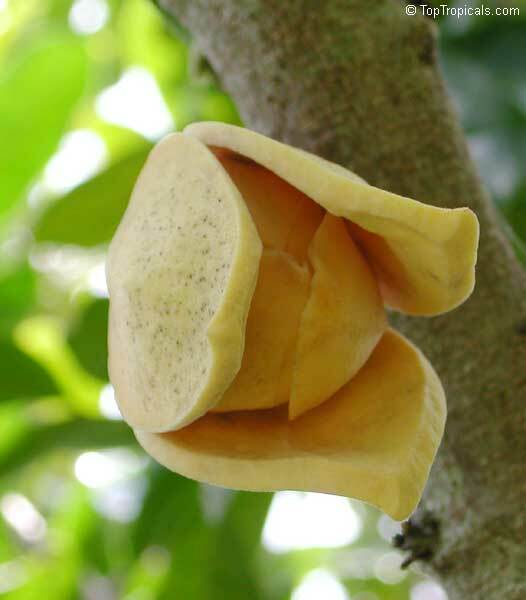 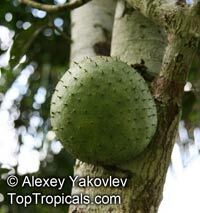 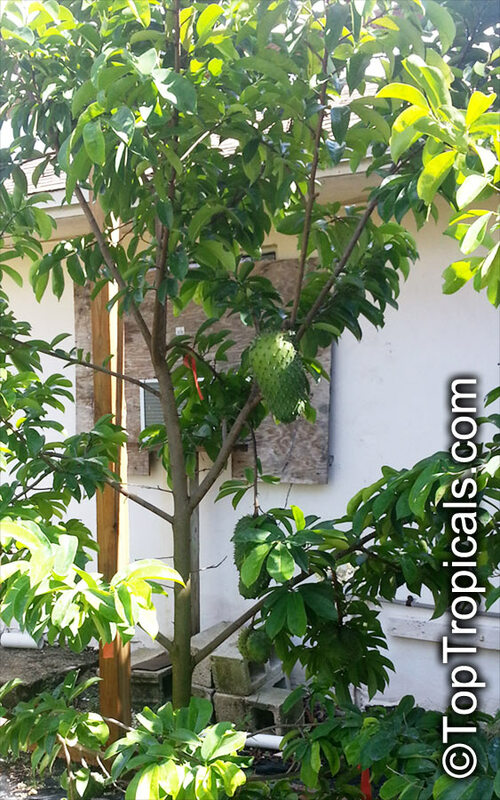 Large fruit, sometimes over 6" long, having similarities in both shape and size to the Annona cherimola. 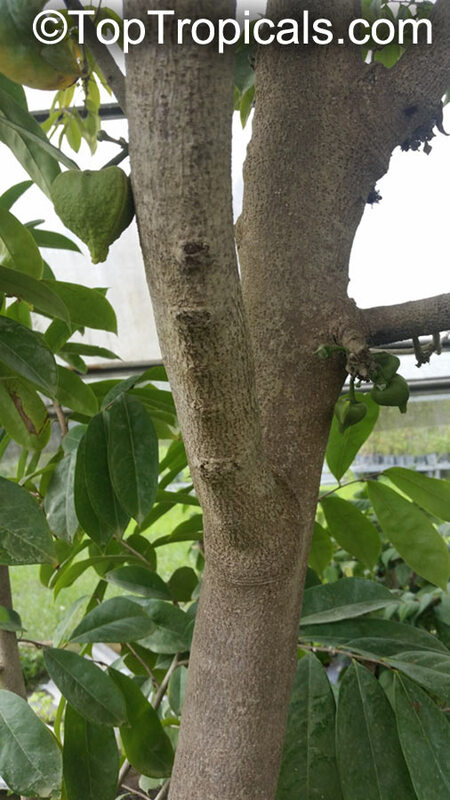 The rind tends to be either green or pink-purple, with white or pinkish flesh respectively. 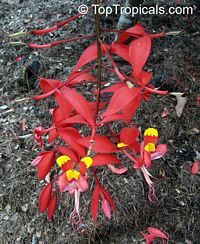 Some varieties have deep red flesh. 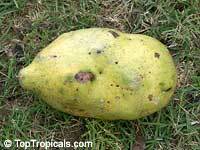 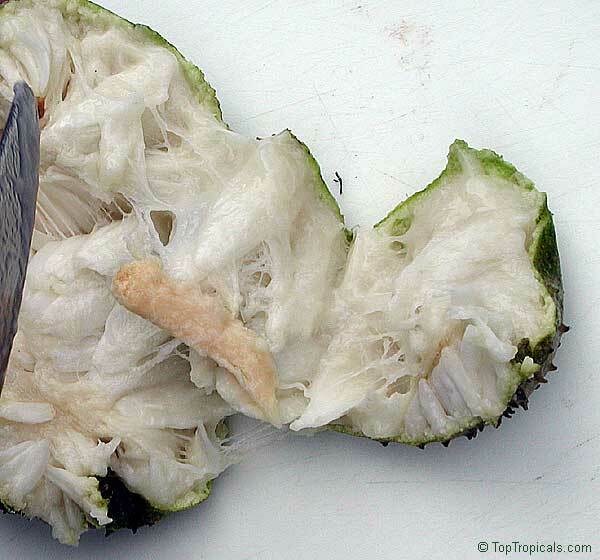 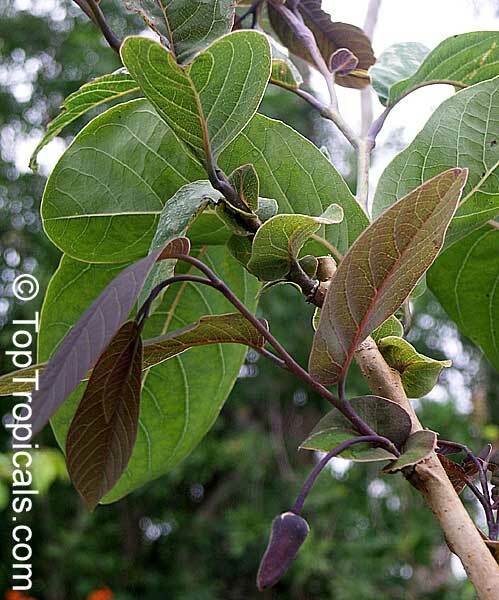 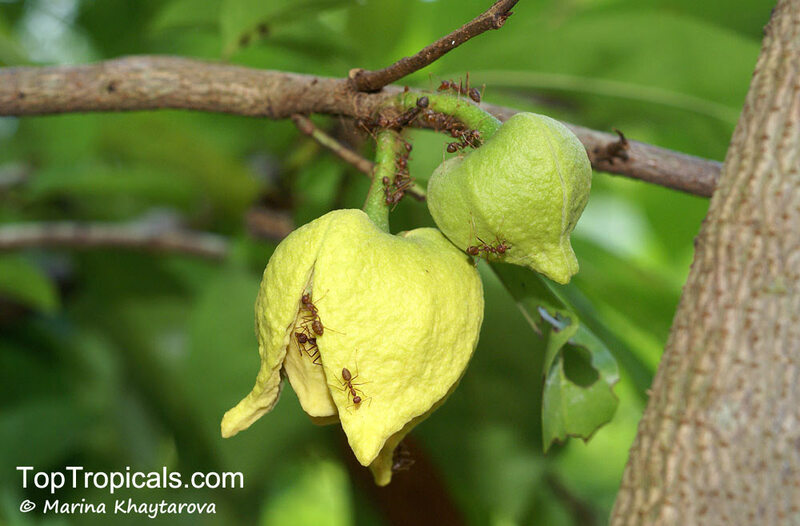 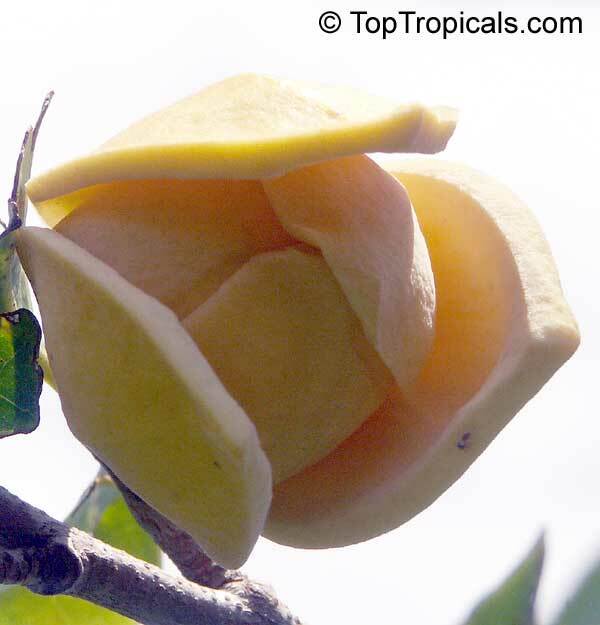 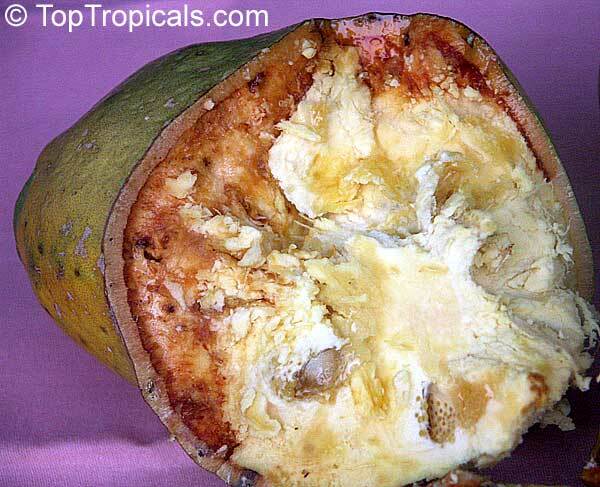 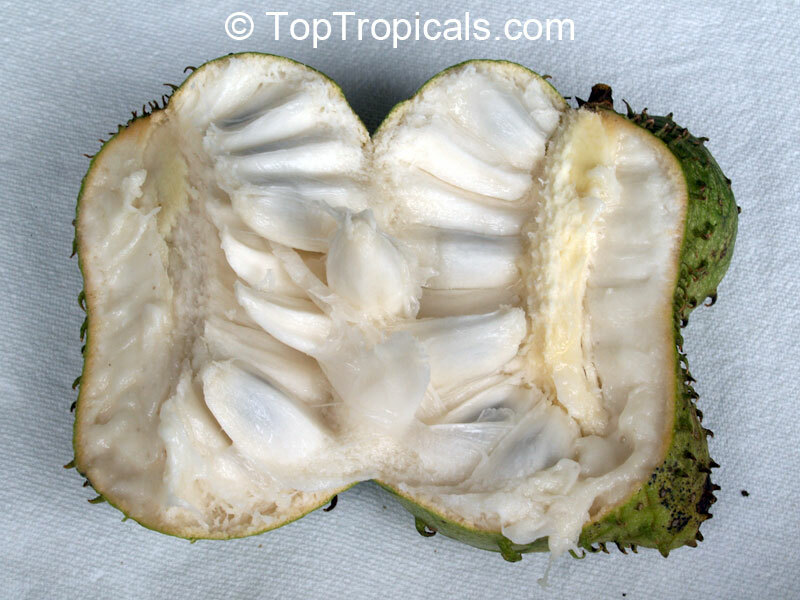 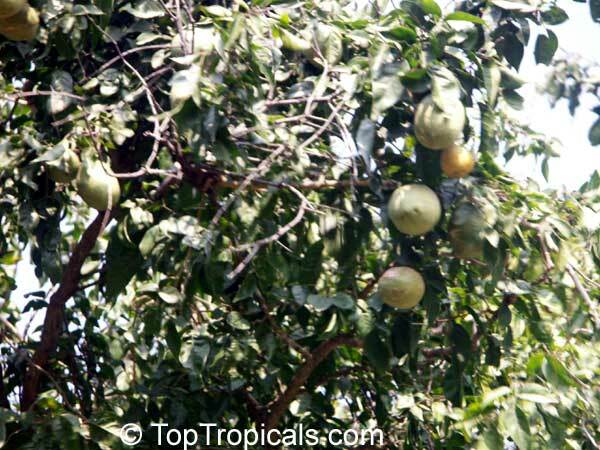 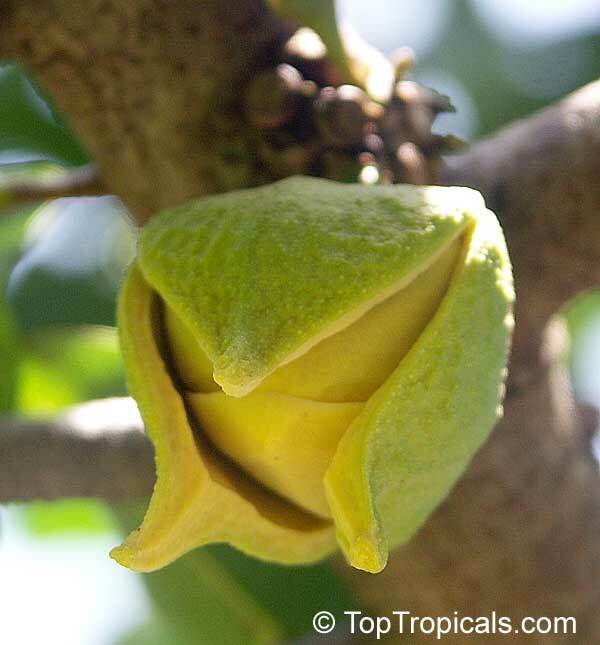 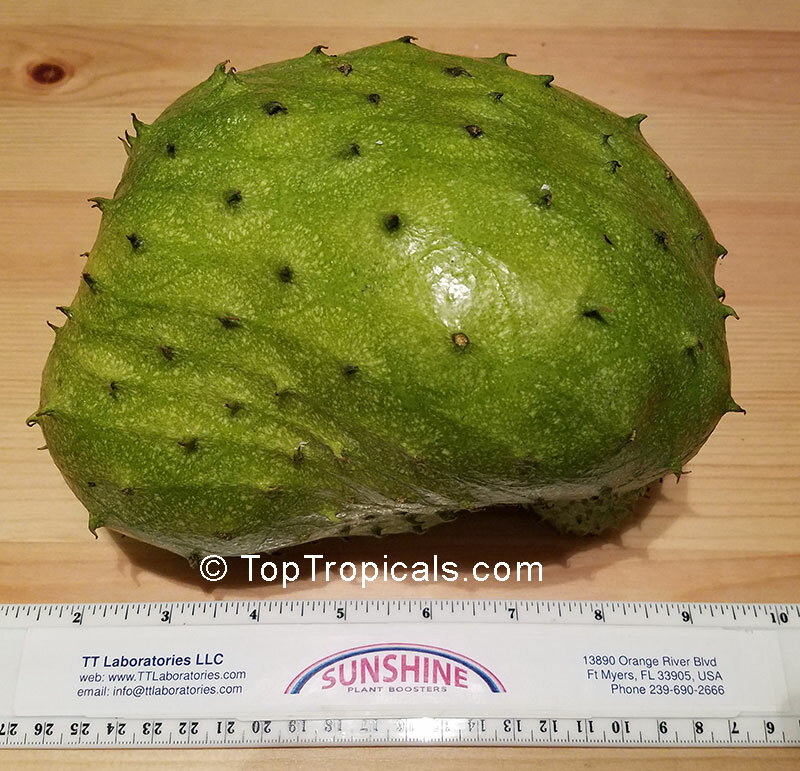 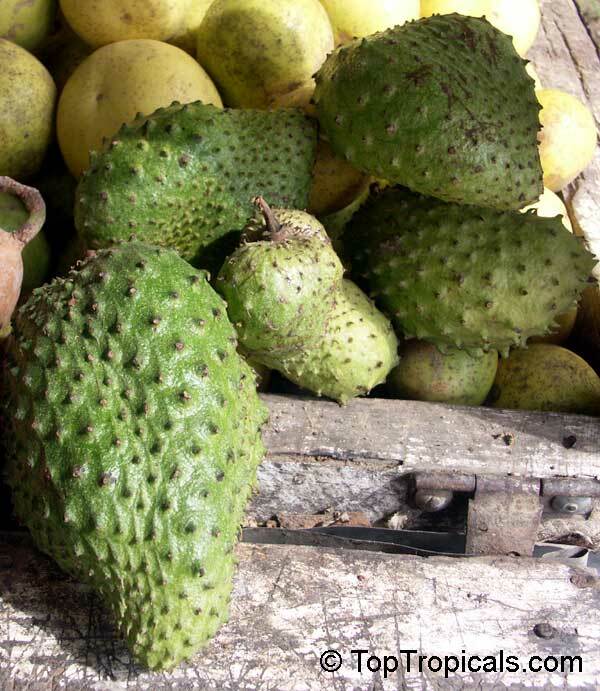 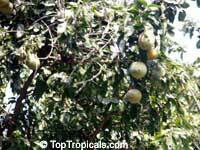 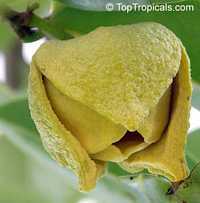 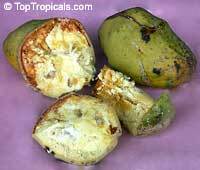 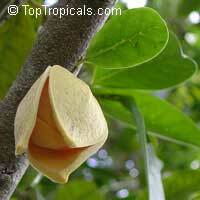 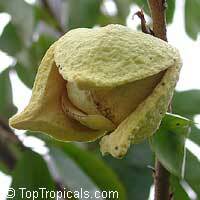 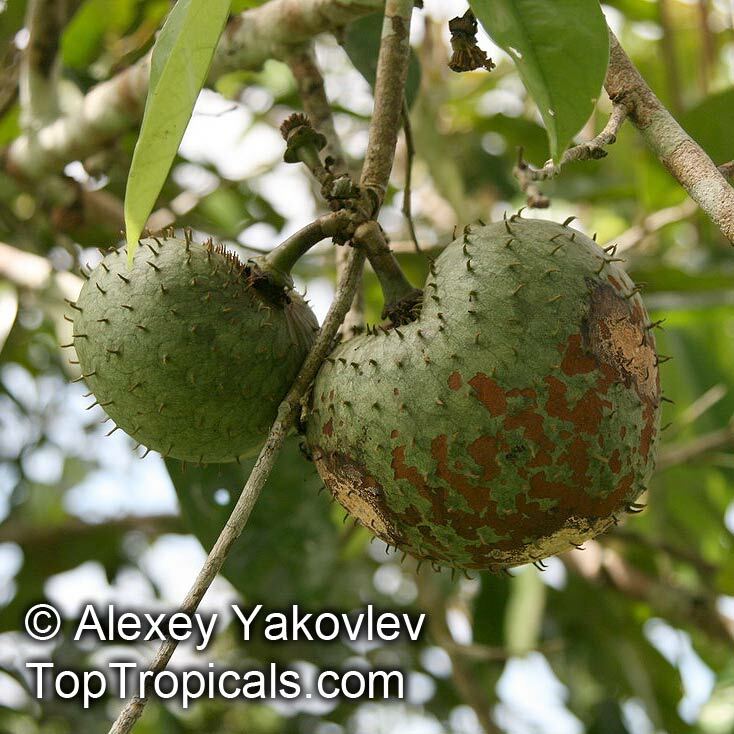 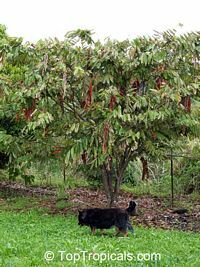 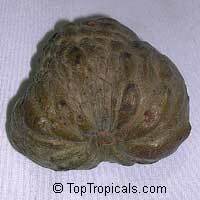 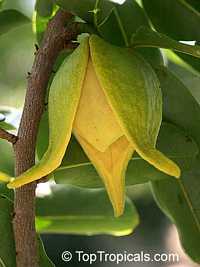 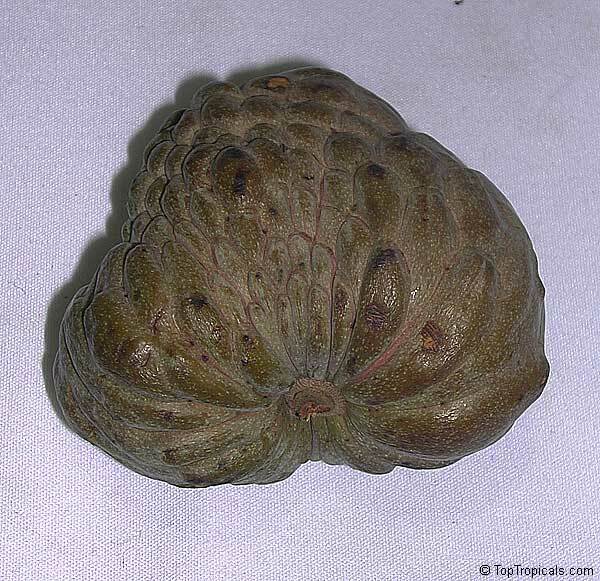 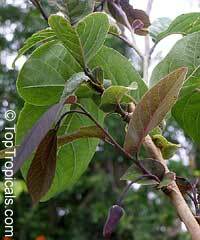 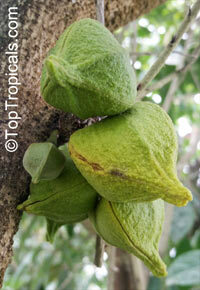 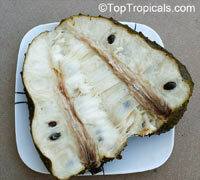 Flavor is said to be excellent in many varieties, rivaling that of the cherimoya and sugar apple. 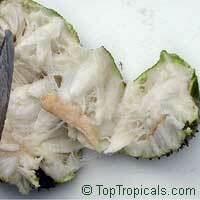 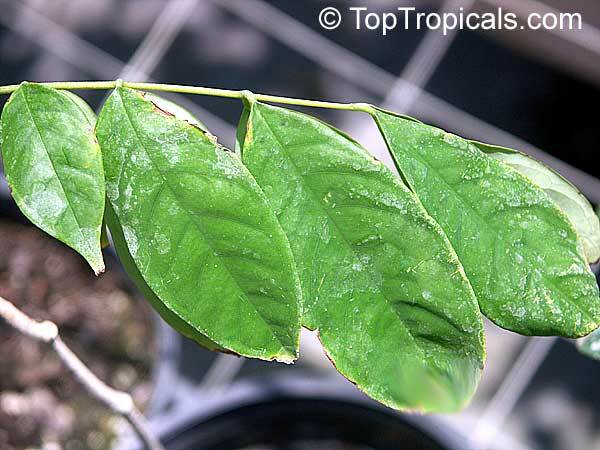 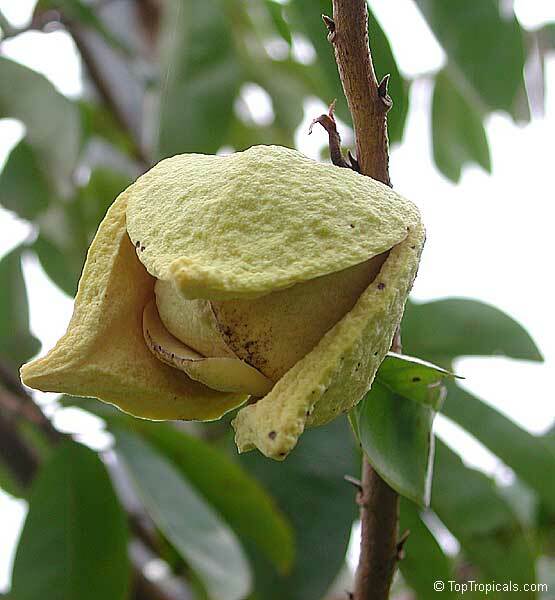 Ilama is the most cold sensitive of all the Annona. 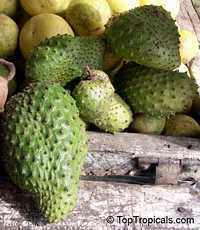 Typically fruits mature from July to December. 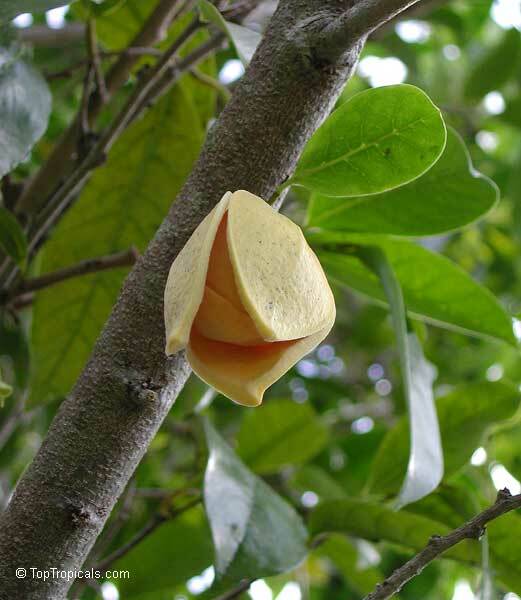 The fruit is almost always eaten raw, out of hand. 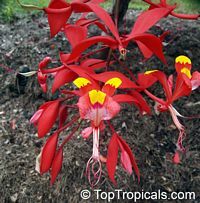 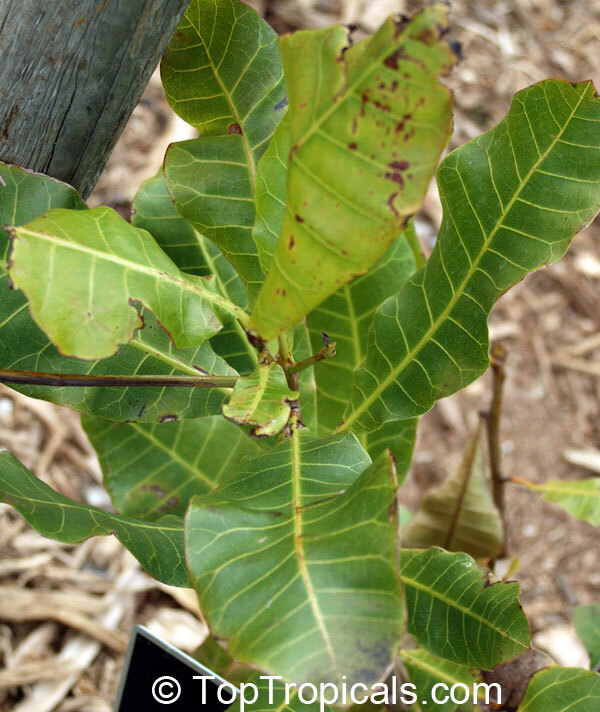 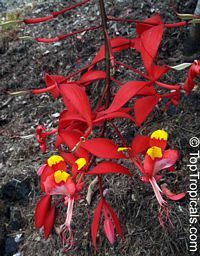 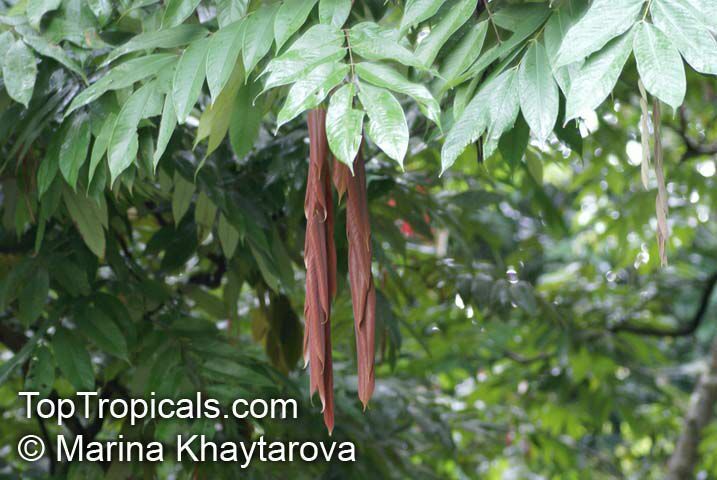 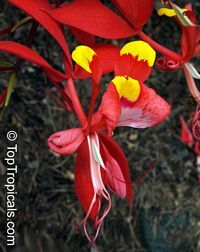 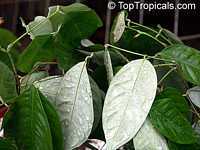 It grows best in climates having a dry season, followed by heavy rainfall. 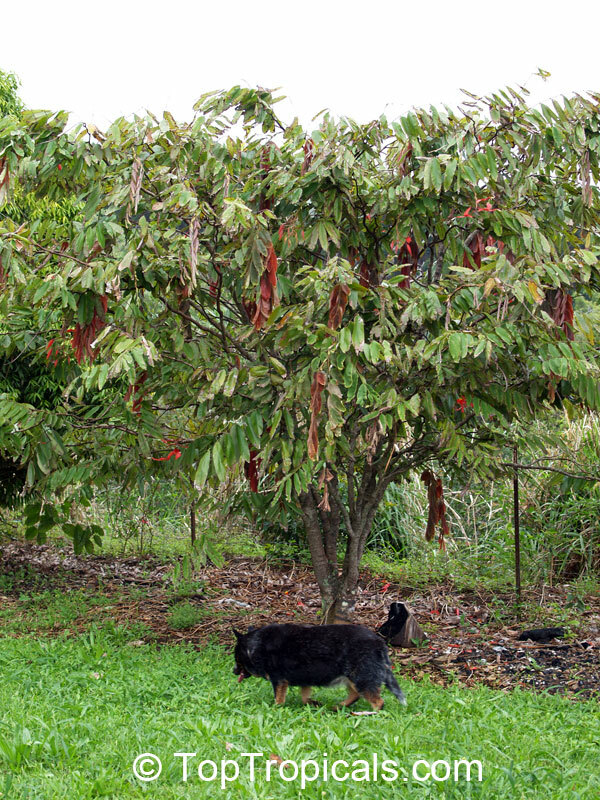 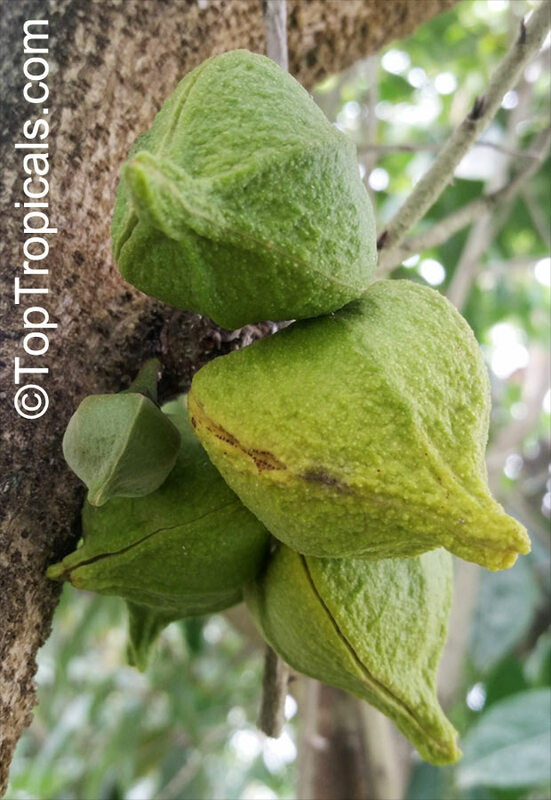 Ilama fruits perish within days of harvest and the fruit transports very poorly, hence its relative obscurity to much of the world. 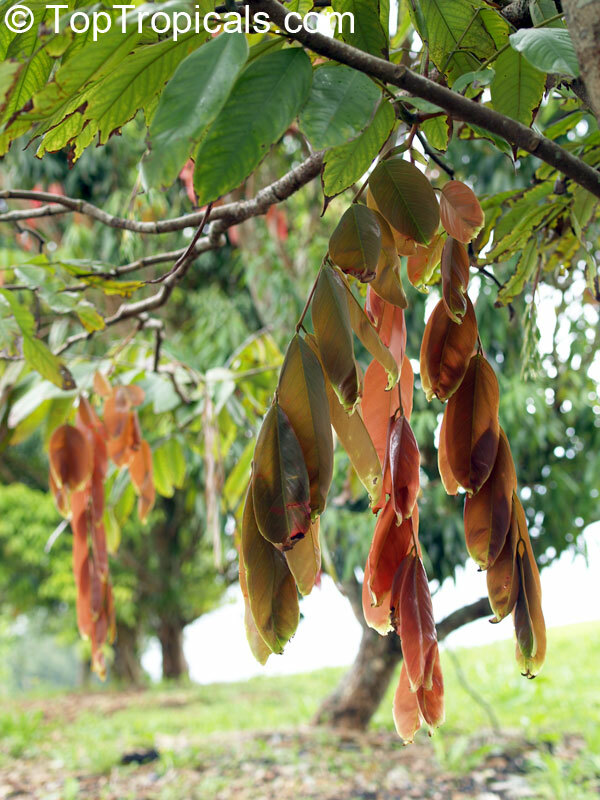 Season: All year, best during warm months. Origin: Tropical America. 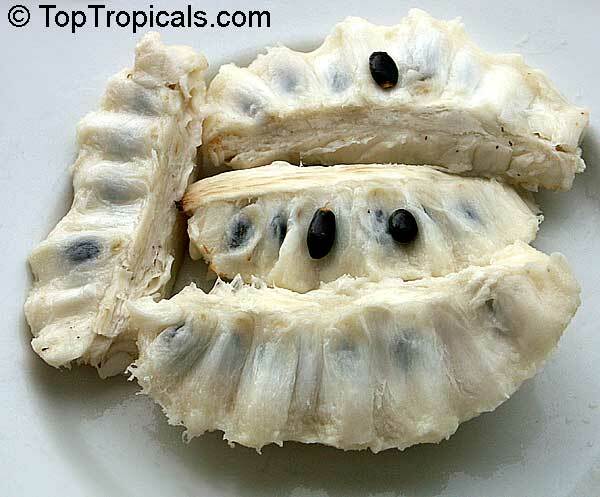 One of the most delicious annona. Fruit is sweet with slight sour addition, flavor is the best. 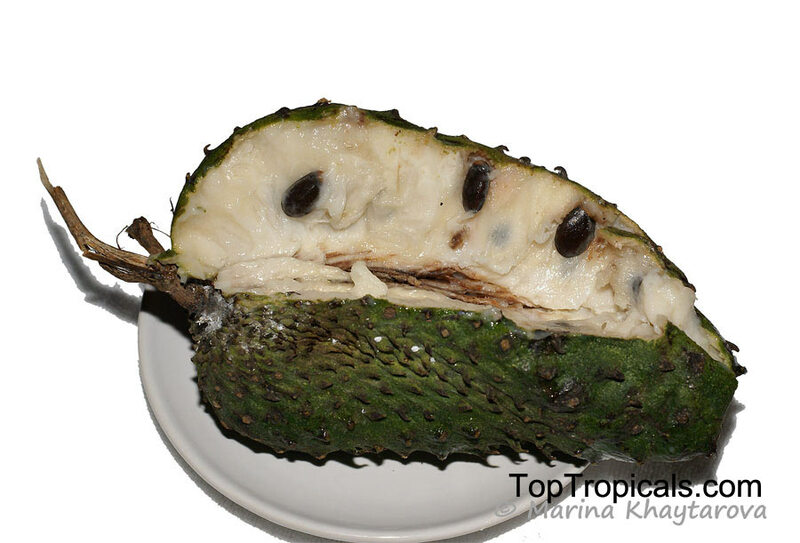 Sweet and tart custard-like pulp. 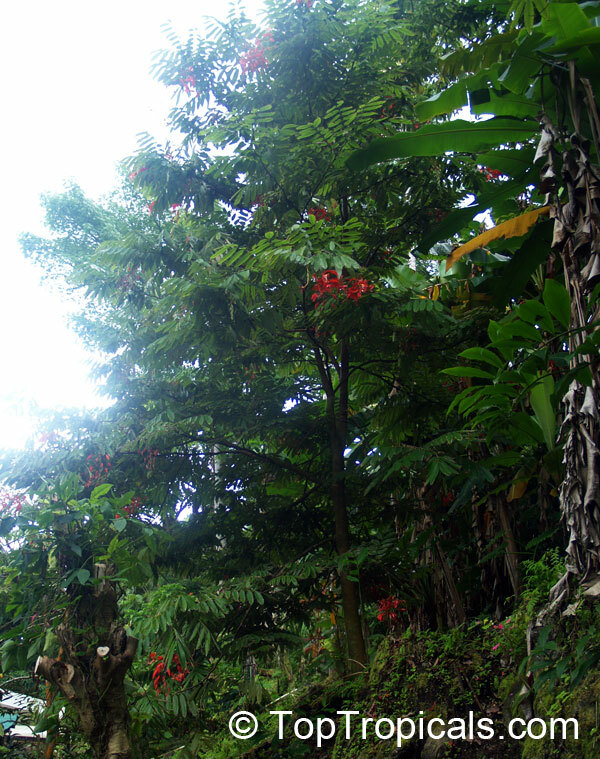 Extremely cold sensitive, minimum temperature 50F. 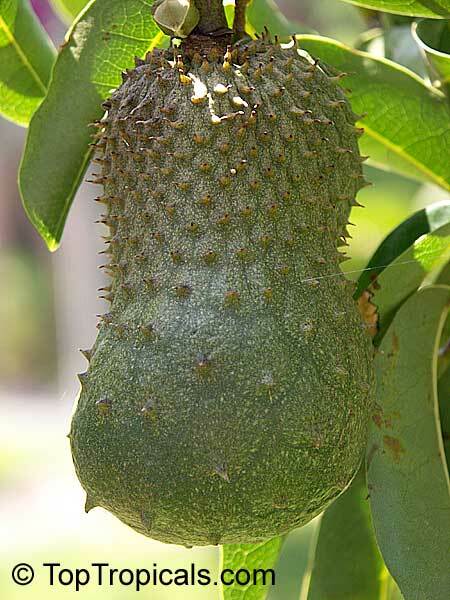 Makes a superb milkshake, but can be eaten fresh as well. 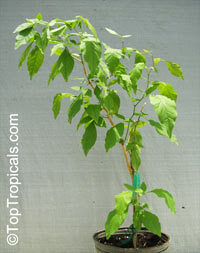 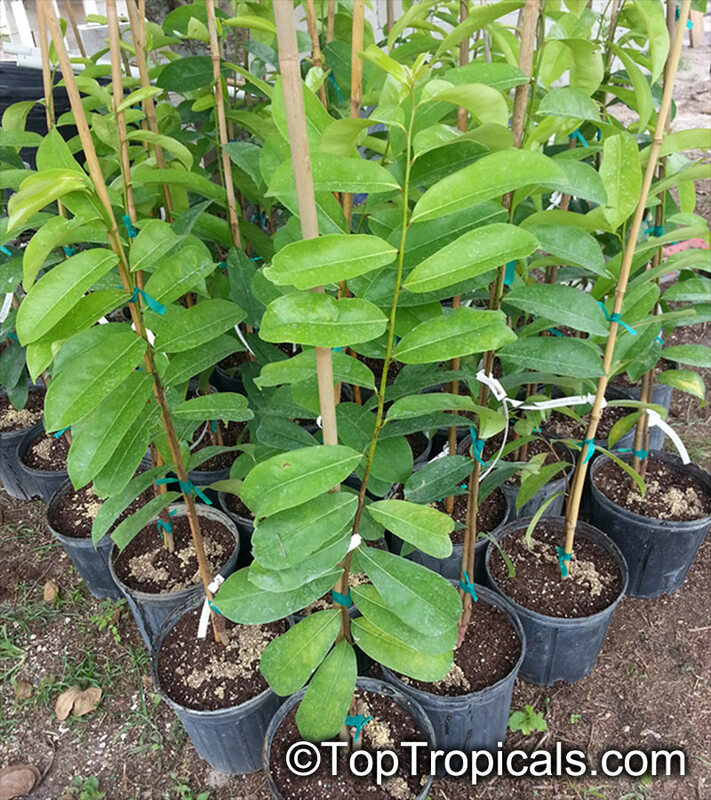 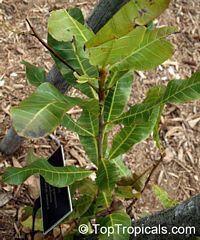 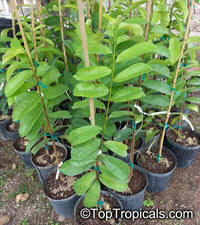 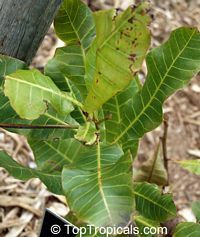 The tree is medium sized, very fast growing. 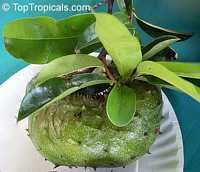 Can be kept in a pot. 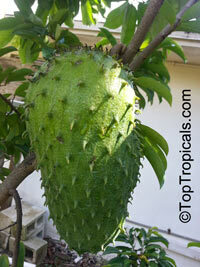 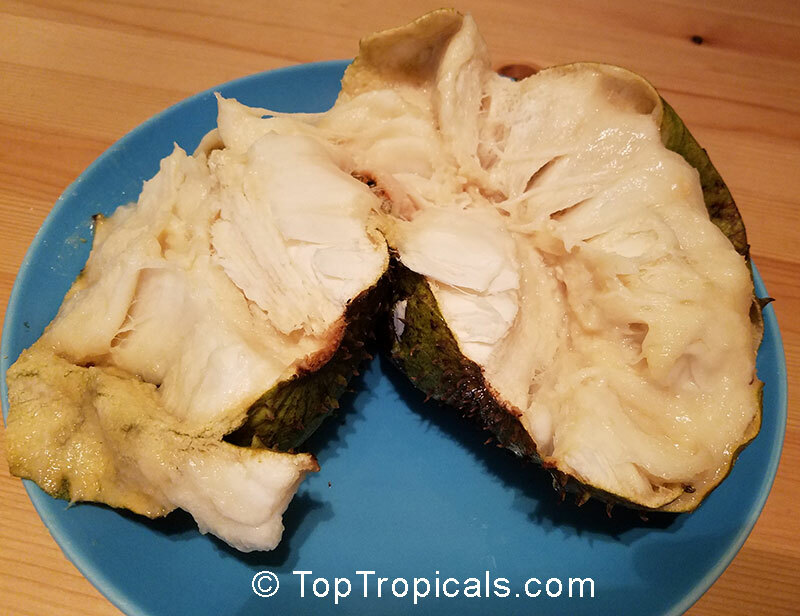 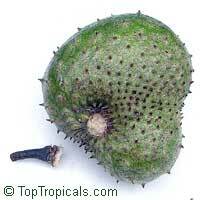 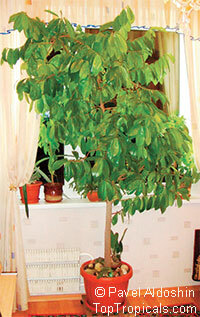 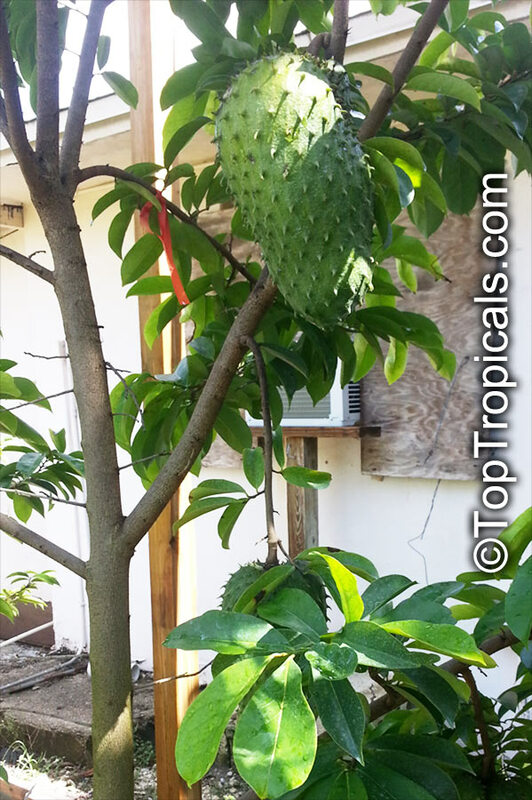 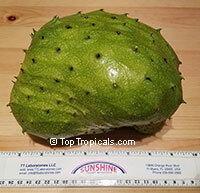 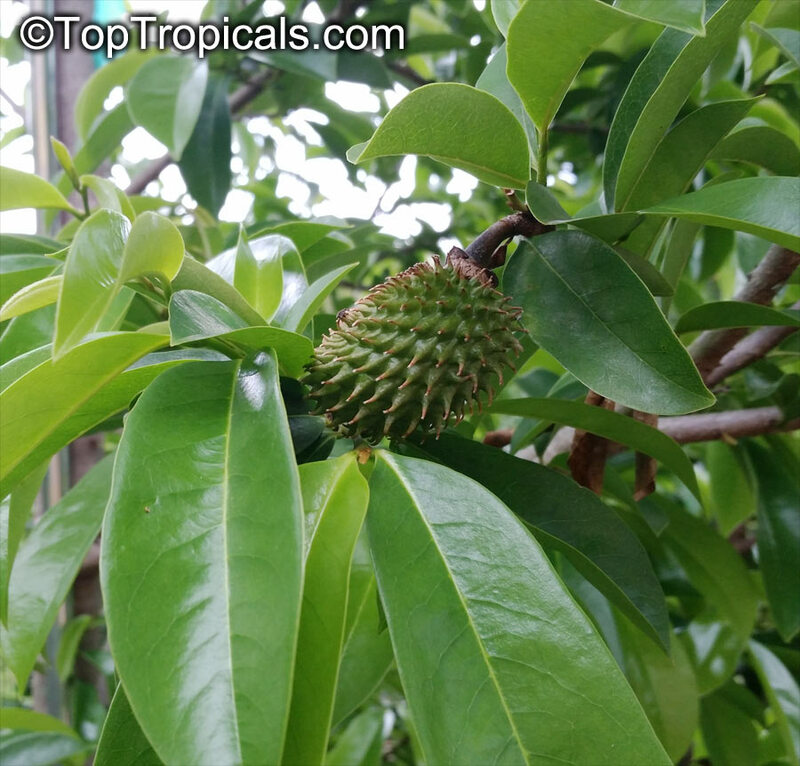 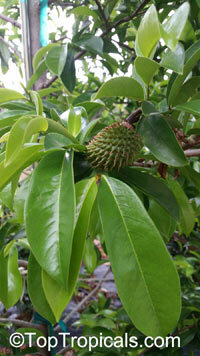 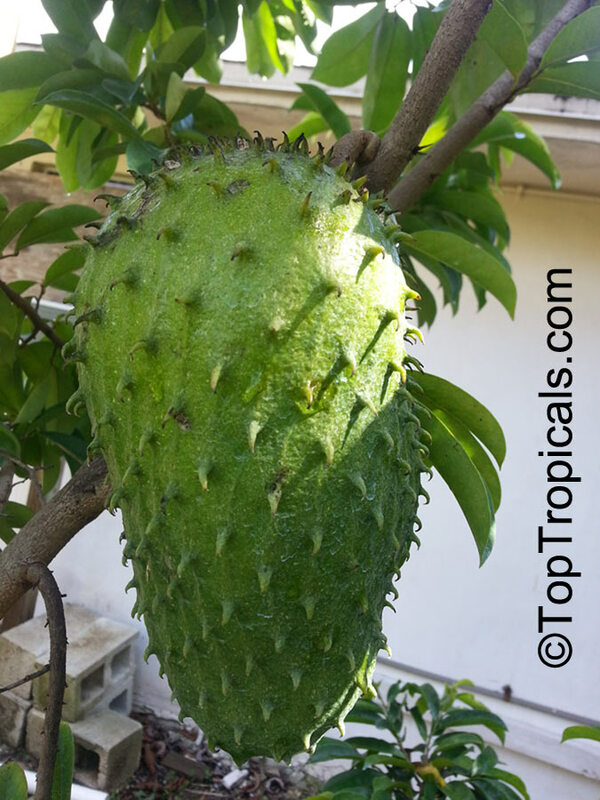 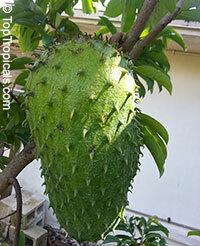 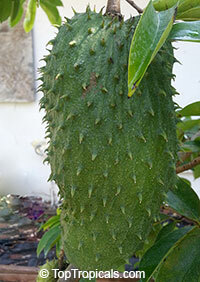 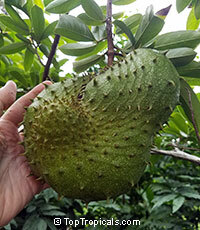 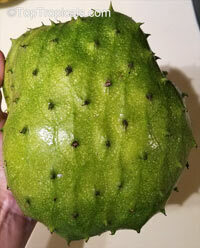 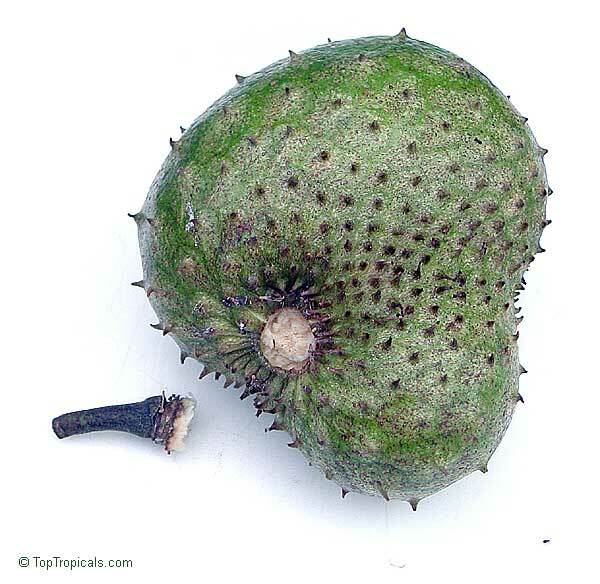 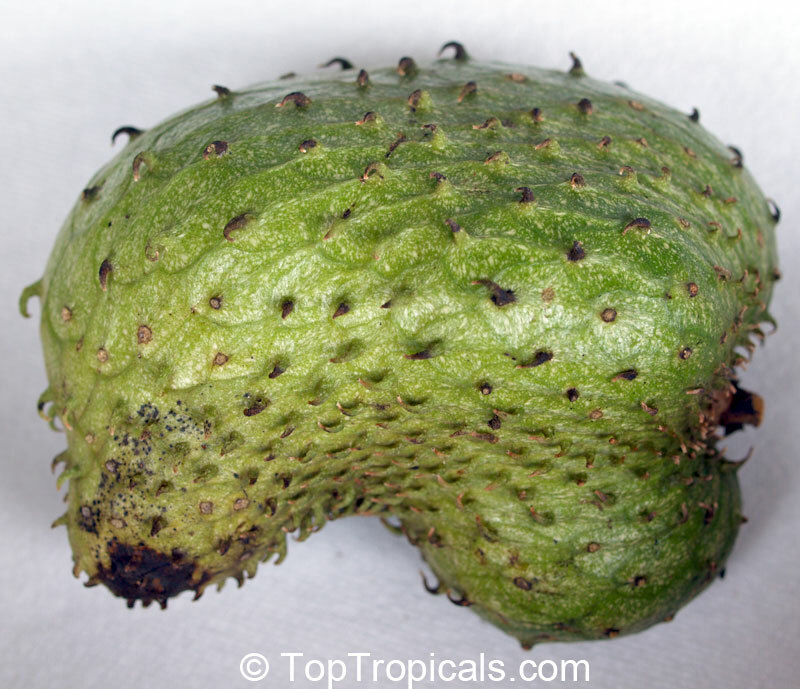 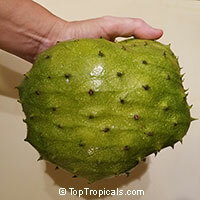 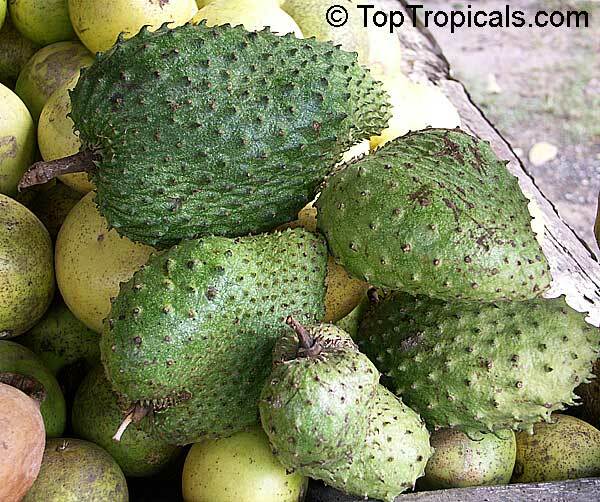 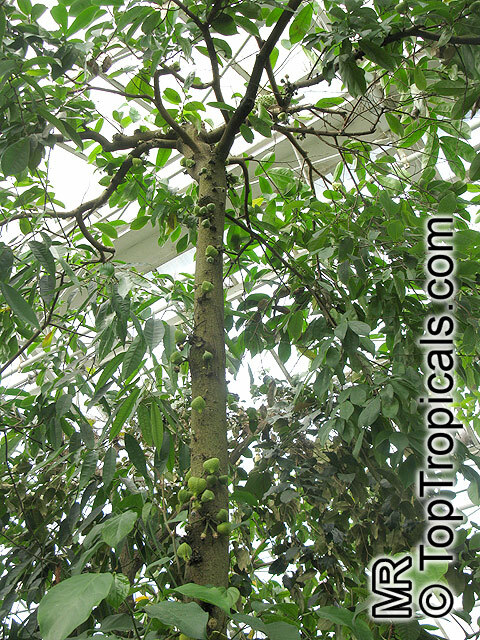 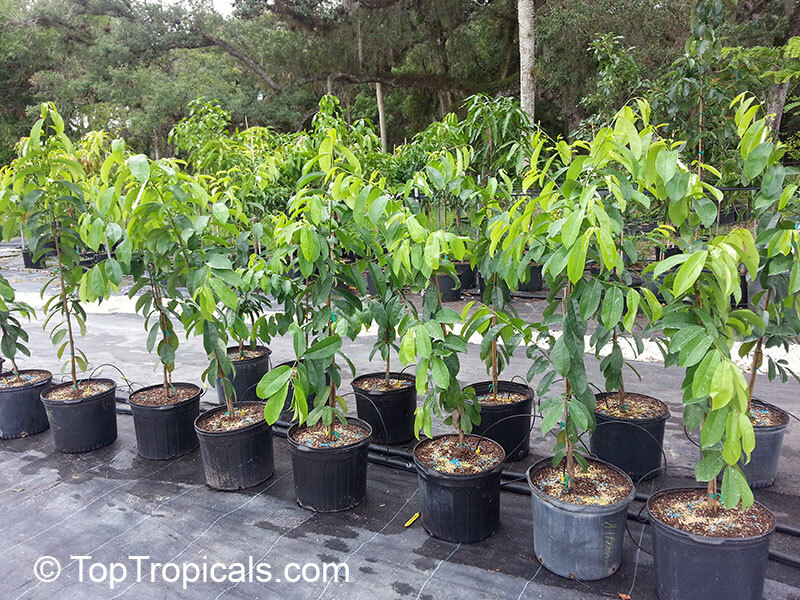 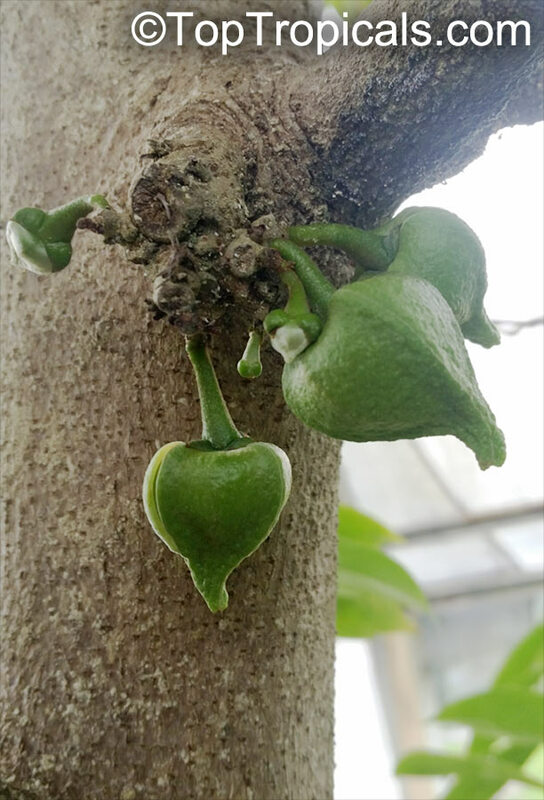 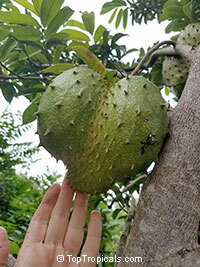 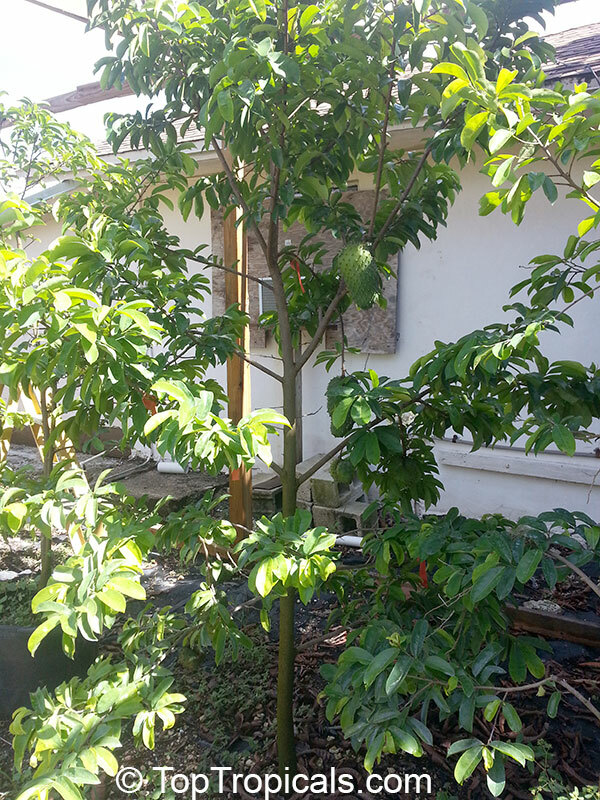 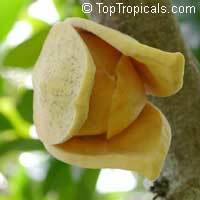 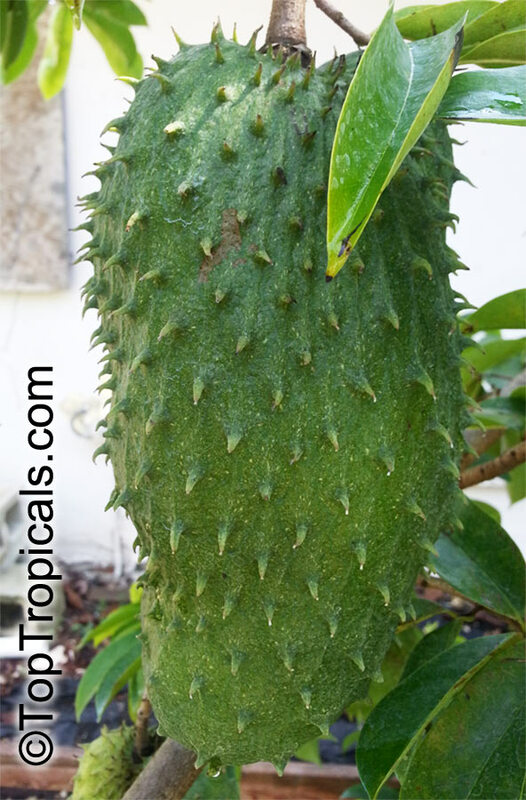 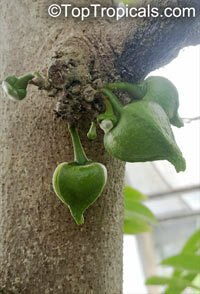 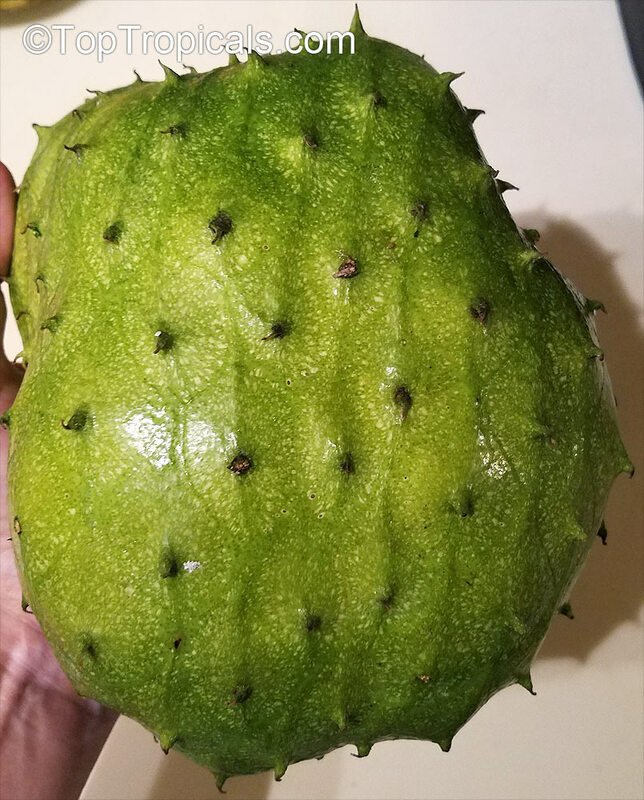 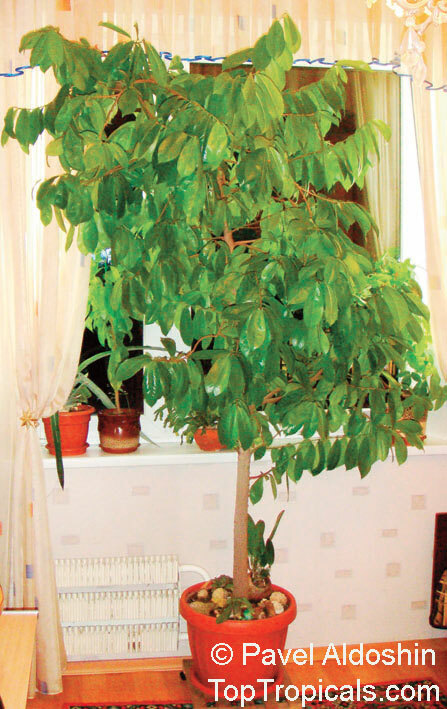 We have very interesting article about growing and fruiting Soursop in apartment. 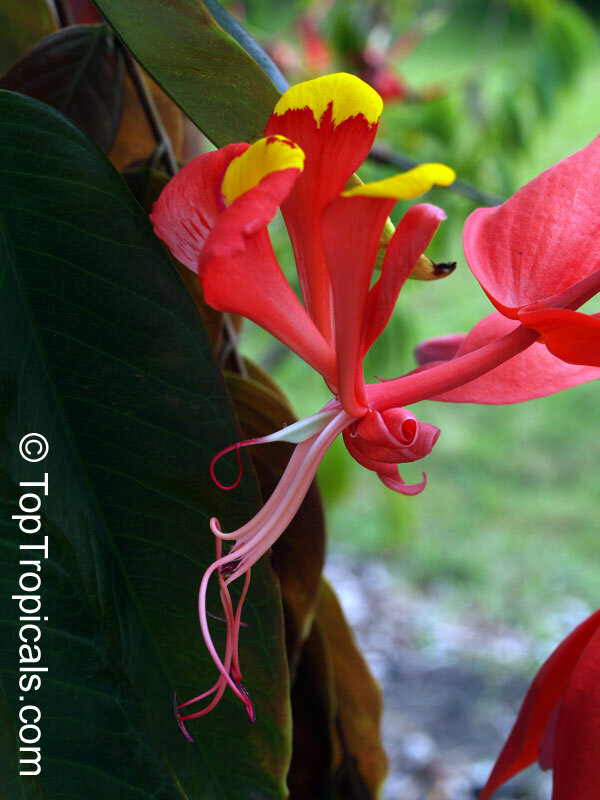 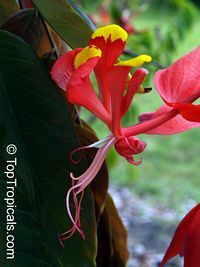 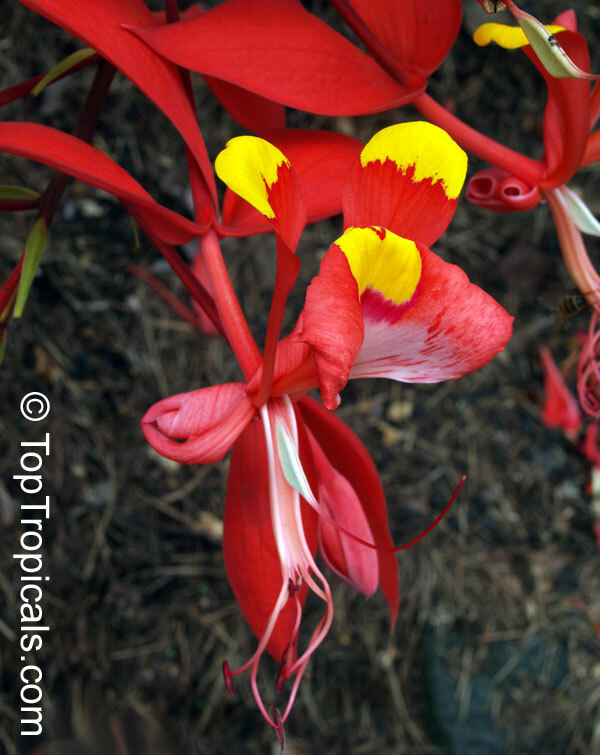 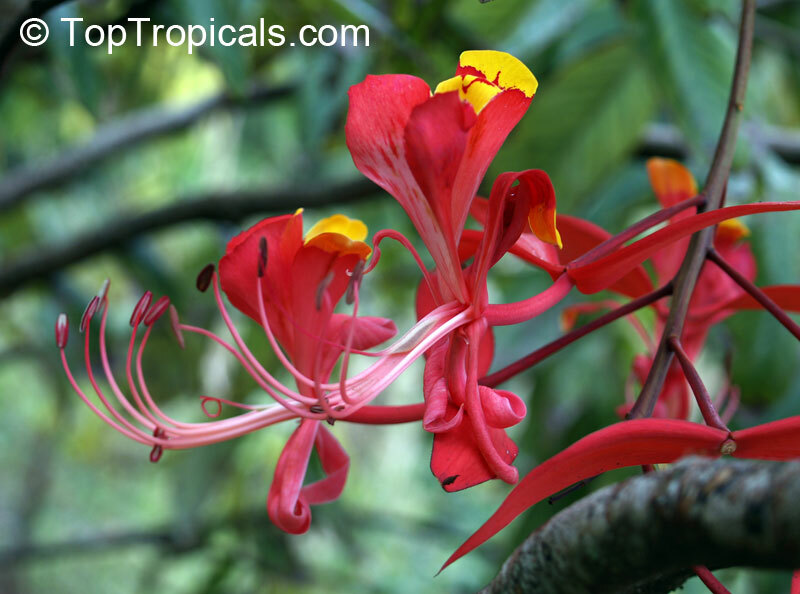 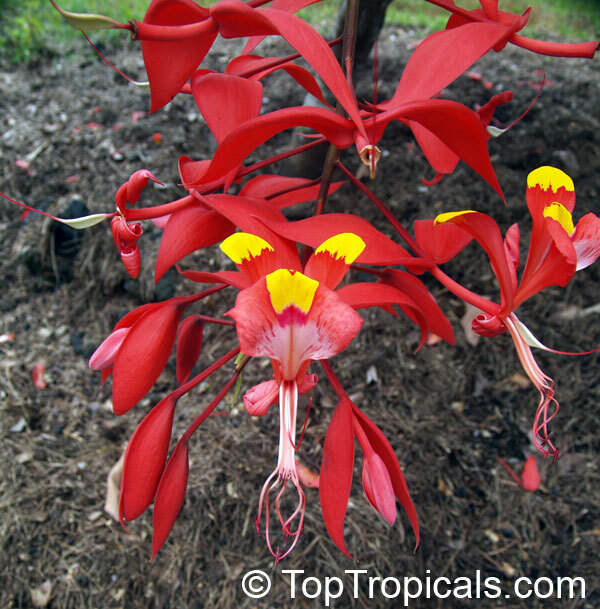 Check out Tropical Treasures Magazine # 7.